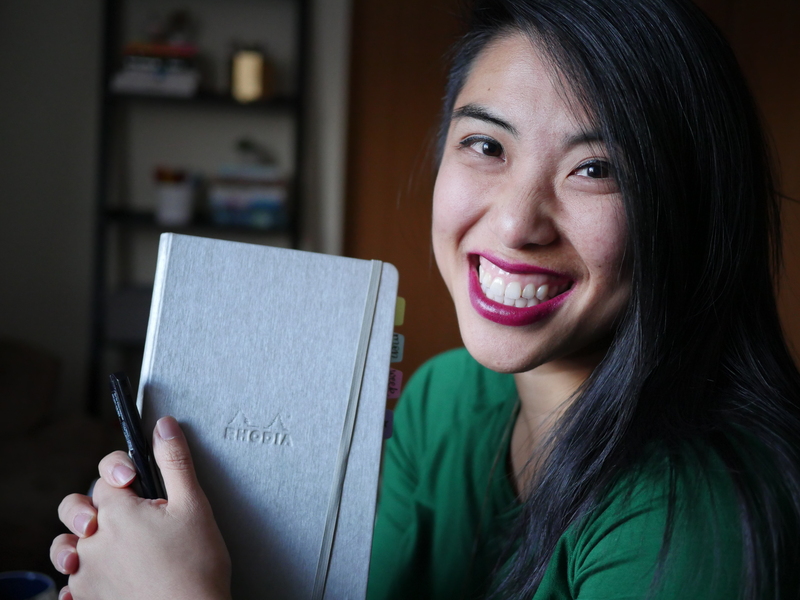 As I approach almost two years using the bullet journal system in conjunction with a really tumultuous year, I wanted to write a few of my own reflections and advice for bullet journal beginners. First of all, welcome to this amazing community. When I stumbled upon the community on Instagram in 2015, I never could have imagined what would come from such a simple system (thanks, Ryder!). As I’ve used the bullet journal and it has grown and changed along with me, I wanted to offer some of my experience and advice for you. To paraphrase a faculty mentor, take what you will from my thoughts – they may be offered too soon to make sense, too late to consider, or miss the mark entirely. But perhaps they will be helpful as well. Start with one of the 1893743 notebooks you have lying around and a pen. This system, despite what online stores with “Bullet Journal Starter Packs” would lead you to believe, only requires a notebook and a pen. Nothing more. Everything else is extra. And before you spend a ton of money on the latest notebook recommendation, you should try it out on something cheap to see if the system works for you, and start to refine your own needs. This is all about you – own it! The freedom and terror of this system is that you completely design it to suit you and your life’s rhythm. So many people have asked me or the community for how to set up a layout for XYZ, or how to refine their system. Honestly it is too hard for me to give suggestions when really, it comes down to what YOU need and what YOU like. What are you using this system for? What do you need it to do? Maybe you need it to keep track of your time, get tasks out of your head, to be kind of a memoir of your life, a creative outlet, a functional task-master… and depending on your purpose, it will determine what it looks like. I usually say, “You can’t skip this work, you can’t have someone necessarily tell you what to do – because it all depends on what will work for you, in this moment.” For some, it’s to be more productive. For me, it’s to be more intentional about the kind of work that I’m doing. Similarly, your purpose will determine your supplies as well. In notebooks, you figure out whether you care about seeing the ink on the backside of the paper, whether you like gridded dotted or lined paper, the size notebook that works best, whether that Rhodia off-white color will drive you bonkers… Same with pens. I have learned (through a crazy amount of experimentation) that I love 0.5mm gel pens, and that felt-tips will merely die a slow death in my grip. You likely have some of those quirks as well. The hardest part might be that you do something not a lot of people do – whether you aren’t into the trackers, the index, or you want to do a weekly spread instead of a daily – if you know it works for you, that has to be enough to not feel self conscious about what you’re doing or NOT doing. That you feel peace with what works for you – that is the aim. Experiment, a lot. Fail, quickly. There is only so much you can do to pre-plan your notebooks and layouts. You won’t know how this will work for you unless you just flipping do it. And it’s OKAY if it doesn’t work! I have tried countless layouts and designs before I got to one that worked for me. When people weight lift, they often push beyond their limits – what my trainer calls “point of muscle failure.” People do this on purpose so they can keep improving and pushing beyond their edge. You will not know your expectations or boundaries or edges unless you cross them – even if it means knowing what DOESN’T work rather than what DOES. That is also helpful. You don’t need a lot of stuff. Don’t buy stuff just because someone told you to – specifically this goes for washi tape, stickers, stamps, specific pens, fountain pens… As long as you have a notebook and a pen, you are a bullet journalist. I am a former scrapbooker and lover of colorful pretty things, so I incorporate a lot of things like handlettering, sometimes tape, sometimes markers to spice up my layouts – but you never need to do that in your journal if you don’t want to. We already have a ton of stuff anyway, no need to add more that’s not on purpose! Your notebook will be imperfect and wonderful, just like you. You’ll feel a strange pressure to not “mess up your notebook” or be disappointed if you misspell your header or hate your layout for the day or week. I’m just going to say it straight – you’re going to need to get over that, quick. Your notebook is not going to be perfect – people won’t judge you as a person for having a little mess up! It’s part of the process, and frankly, it’s hilarious most of the time. I just cross it out and keep going (like the page above), or turn the page. That’s part of the lessons I’ve learned about myself through this system – that life is gloriously messy, beautiful, sometimes rough, full of hard days and hopes and dreams and our notebooks are absolutely going to reflect that as well. What words of wisdom would you give to new bullet journalists? Sharon, I am so glad this letter was helpful for you – and hope that you’ve still been able to bullet journal your way 🙂 sorry for the delay in my reply! Thank you for this! I’m new to bullet journaling and bought a notebook that I stared at for over a week because I didn’t want to “mess it up”. Then, I finally decided to put my future log in and the ink bled through–Horrors!! It’s a Leuchtturm and I didn’t think that was supposed to happen?! So, I stopped writing in it and have been searching for what I did wrong, but now my beautiful notebook (that I special ordered in the new shade of blue) is “ruined”. What to do?? Colored pencils?? Your post has helped me to understand that I need to let go of the pictures I have in my head of all of the beautiful layouts I’ve seen on Instagram and make this work for me. They are very inspiring, but I can’t let them stop me from forging ahead. It would help to know what you would recommend for writing in ink–just a regular pen, not fountain–that will not bleed through. Thanks! I totally get it! …it drives me insane when my pages bleed-through or I make a mistake. I recently started to just move to the next blank page or spread and finish what I was initially doing. I then go back to the messed up page(s) and transform those pages into a page of quotes/saying/reminders. Just a thought 😉 Hope this helps! Patti! How has this been going for you? I’m delayed in my reply, I know… forgive me! Have you been able to fail fast and fail forward with your experiments on what works in your bullet journal? In my Leuchtturm I’ve had great luck with Pilot G2’s, Staedtler’s if you like felt tip and some others – have you tried other pens since? Perfect post, thank you! I’ve just started bullet journaling this year and I do use weekly spreads instead of dailies 🙂 It works for me so far (it’s been an entire week, haha!) but initially it bothered me that I don’t use a ‘real’ bullet journal system. Now I understand I need to make my journal to work for me, not the other way around. Thank you for those tips and for all your awesome posts which have been a great help in setting up my own system. I started in August and fully endorse trial and error. The how and why I use my bujo keeps evolving, and I’ve learned so much about myself in the process. I started out minimal thinking how rediculous it would be to spend time decorating a planner. I wanted to get more done. It didn’t take long for me to figure out I feel better when I create something each day, and my journal now reflects that. Who knew? And it may change again… which is why I love this system. Thank you so much for this post, Jessica! I received my first Leuchtturm Bullet Journal for Christmas (at my request) and I haven’t been able to bring myself to start using it yet because I’m afraid of messing up, especially as I’m not sure which of the amazing setups that I’ve seen will work best for me. Maybe I just need to go back/to basics and start from there! this Bullet Journal Newbie thanks you for some wonderful advice! It’s amazing what we find when we go to the core of something and build from there! Thanks for all this info! Just got my first bullet journal, not going to start too complicated or else it probably won’t look like the ones on instagram.